This is our assignment for the Aspire and Inspire sparkteam: October 12 was World Egg Day. 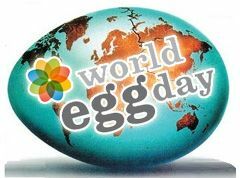 World Egg Day celebrates and promotes the benefits of eggs. It is truly a world, or international, celebration, from China and New Zealand, to Great Britain and Mexico. What's your favorite way to enjoy eggs? Do you have a favorite egg recipe you would like to share? I do think eggs are a healthy addition to your diet. The way I have eggs the most is scrambled. I also enjoy deviled eggs, omelets, and quiche. I’ve never made quiche myself, but I have had it at restaurants. Here’s a bacon and cheese quiche recipe from Pillsbury that I found online. It sounds pretty easy. 1. Heat oven to 350°F. Place pie crust in 9-inch glass pie plate as directed on box for One-Crust Filled Pie. 2. In medium bowl, mix half-and-half, eggs, salt and pepper; set aside. Layer bacon, cheeses and onion in crust-lined plate. Pour egg mixture over top. 3. Bake 40 to 50 minutes or until knife inserted in center comes out clean. Let stand 5 minutes; cut into wedges. Thanks for the recipe. I might fix that some day soon. I love quiche, especially with spinach and mushrooms! I usually have eggs three or four times a week - I never get tired of them! I like your picture of the two smiling eggs! I do eat eggs, but so often I get sick of them. I prefer an omelette, but I will eat them over easy and sometimes sunny side up. I try to eat cholesterol-free liquid egg product as I have high cholesterol, but it is getting too expensive when compared with a carton of eggs at the store, even though I waste most of the yolks from cartoned eggs by not eating them. I am primarily vegetarian, and am interested in substituting tofu for eggs. But I do understand how eggs are an important food source and if, you have your own chickens, inexpensive and very fresh! I like eggs & veggies in a muffin pan. And fritattas. Oh, and just plain hard boiled. My favorite way to enjoy eggs is from a distance. I'm highly allergic to them. Eggs are one of the top allergens, but they are in everything. I have to read labels carefully. Great blog and I especially like having that recipe. I like quiche but have never made one wither. It does look easy enough for me to try it.